Get exactly what you want and need out of your container, storage trailer or office trailer! This is just the beginning of how Wayside can customize your unit just for you. Not sure exactly what you need? Come in to either of our locations for a FREE CONSULTATION! This three shelf unit uses two – 2×10” pieces of construction grade wood per shelf, resulting in a shelf that is 18 ½” deep. 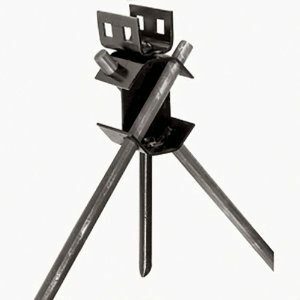 The load rating is 55 lbs per bracket arm and 1100 lbs per bracket. Two brackets means you have 2200 lbs load capacity. This ramp is essential for anyone looking to move items in and out of their storage container with a fork truck. Ensure the safety of yourself and those around you buy utilizing the proper equipment. Poly Shipping Container Ramp for use with hand trucks and dollies for loading and unloading. Constructed of high-density polyethylene (HDPE) for excellent strength and durability. This lightweight ramp (25 lbs.) also features a 750 lbs. max load capacity. Adjustable to fit the vertical bars on the containers doors. These locks are highly recommended for construction site storage. These locks are easy to install and can save you thousands of dollars by protecting your valuables from theft! 120 LED light bar. This light bar features recessed fold away hooks, magnetic ends on retractable cords, and two magnetic clips for a variety of mounting options. The rechargeable battery eliminates the need for power to the container. One light bar per every twenty feet of container space is suggested. Provides four support arms mounted at 30 degrees to enhance volume capabilities. Each support arm is gusseted for added strength and includes a roll stop to enhance safety within your container. Protect your mobile office from theft with our security bar. These are highly recommended for office containers at construction job sites. NEW! Removable office kits are a great addition to your container rental. Currently available for 20′ containers this kit can be installed in just a few hours and features air conditioning, lighting, and electrical outlets. The container doors can be fully closed and locked with a Heavy Duty Container lock to protect your valuables! Available for both purchase and rent. Standard venting in containers can vary between each manufacturer. Some containers come with 4 vents preinstalled while others come with 2. Adding additional ventilation can reduce the effects of condensation that results from the fluctuation in outside temperatures. In some incases a standard vent may not be sufficient depending on what you are storing in your unit. If you are storing clothing or upholstered furniture you may want to consider the installation of a louvered vent for additional airflow. Electric fan vents are ideal for customers looking for a highly customized unit. For example, Wayside has built many mobile boiler rooms in which the electric fan has been installed for maximum ventilation. Wayside is proud to offer environmentally friendly spray foam insulation as an option in our units. Ask your sales rep today for more information on how we can built a custom unit for you! Container roll doors are one of our most popular container accessories. This doors allow easy access to your stored items. These doors can be installed on the side of the unit or on either end. Many customers will opt to replace the existing barn doors on their unit with a roll door. Whether you are looking to turn your container into an office, a man cave, or a concession stand for your local baseball field Wayside can make it happen! We can transform a standard shipping container by adding doors or windows to meet your needs. This unit offers maximum accessibility to your stored items! This unit features a standard barn door on one end as well as one side that can open up completely. 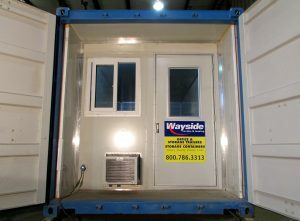 Wayside can work with customer supplied prints to build the container you need. Our team of welders, plumbers and electricians are always up for something new. As your sales rep today how we can brings your ideas to life. A meyers hub can be installed in any container for customers who would like to run power to their unit via an extension cord. The number of preinstalled desks can vary from container to container. Additional desks can be installed at the customer’s request. Plan tables are ideal for anyone who will be reviewing prints on their jobsite in their office trailer/container. This simple addition to your work space can make a big difference! Security screens are recommended for anyone who is not confident in the security of the location in which they will be storing their unit. This one time installation fee will offer you priceless peace of mind during your rental period. Stairs are necessary for each door on an office trailer as they do not sit flat on the ground. Office containers do not require stairs. Skirting an office trailer offers a finished and complete look to your unit. If you will have the unit for an extended period of time skirting will give your trailer the look of a permanent building. Skirting is also recommended for office trailers in the winter as it will stop the rush of cold air under the unit from making the floor cold. Hurricane tie downs will securely root your mobile office. These are recommended for sites near the coast or anywhere that high wind speeds can be expected. Adjustable to fit the vertical bars on the storage trailer doors. These locks are easy to install and can save you thousands of dollars by protecting your valuables from theft! King pin locks protect your storage trailer from being connected to and moved by an unauthorized driver. These shelving units are installed and braced to ensure no movement during transportation. Shelves are installed in 8 foot sections and can be arranged a many different ways to optimize your storage capacity. Have Questions? Contact Sales For Details. CALL NOW!